Rachel is one of my favorite, favorite bloggers. She's soulful, witty, insanely creative (truth be told, I'm a smidge jealous of her creativity.) She makes crafts that don't feel crafty, cooks lovely meals, takes gorgeous photos, is a prolific gardener... Pretty brilliant gal, no? I'm so excited to be here on Joslyn's lovely blog, participating in this fun series.When I first tried to list my favorites I ended up with about a million things, so I decided to narrow it down to actual objects that I use and love every single day. That made it a little bit easier. Tea - I drink an unreal amount of tea every day and Harney & Sons is one of my favorites. Since discovering the joy of electric kettles (no chance of forgetting it on the stove and burning the house down!) I've never looked back. I own this Cuisinart kettle and I love it. Simple beauty supplies - I am a pale, dry skinned girl and I don't like spending too much time on my face. I haven't suffered from a sunburned nose since I started using Neutrogena Healthy Defense lotion every day, and it's great for gentle skin. Blush is basically the only makeup I wear daily, and Benetint is still my fave. Blistex DCT is an addiction for all the women in my family (maybe it's genetic?). I panic if I don't have some with me at all times. Reuseable bags - I haven't used a plastic bag since I found Baggu a few years ago. I keep at least three in my purse at all times (easy, because they fold up tiny) and use them everywhere, including clothing stores. My camera - My Nikon D40 is one of the best investments I've ever made. I take photos every single day and I feel like I see the world and all the little bits of accidental beauty more clearly than ever. Kitchenwares - I spend a lot of time in the kitchen, so I like everything to be beautiful and highly functional. I collect Dansk Kobenstyle pieces and they are hung on the main wall of my living room. This way I get to admire them even when they aren't in use. My Kitchenaid food processor is my favorite piece of modern technology and I use it all the time - completely worth the expense. I have a little collection of cake stands and I always keep a few of them on the dining room table with a rotating display of lovely things. oh yay! rachel is one of my very first stops each and every morning. 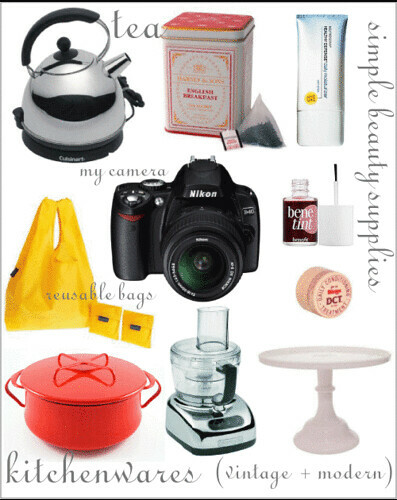 her list of favorites adheres to the name of your blog beautifully. I love Rachel too and adored hearing more from her in this little message. Rachel has been such a good blog friend to me. She has awesome style, and a good attitude. I'm so glad she was featured here. Love her! Lovely soul, will pop over to her blog! How wonderful! I find so much inspiration through Rachel too! Thanks, Jos! (And all you sweet commenters). Pulling the list together was so much fun. Rachel is one of my all time favorite blogs to visit :) Thank you for this expo on her favorites! 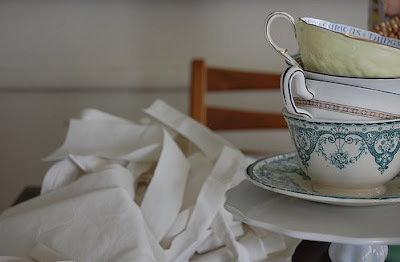 I loved going through these links and I LOVED those tea cups at the very top. SO beautiful!! Rachel is awesome, this was a great post! It's always nice to get to know my "daily reads" better! I love Rachel's list. I've never quite got my head around why an electric kettle is so rare in the US! oh, everybody loves Rachel. And I thought I was so special because I do : ) Rachel : I love your simple, practical, beautiful list. And we use the same moisturizer! I absolutely adore her and her favorites. I have a Nikon D40 too, and its the best gift I've ever received! The quality of the photos is incredible! Huzzah! sorry i'm late, but i had to say, beautiful list! you've inspired me to look into electric tea kettles--and to try to switch from coffee to tea. also, i'm on a mini-crusade, if you will, to enlighten the world as to why they are "addicted" to mainstream lip balms. if you look at the ingredients list of chap stick and blistex, the main "skin protectant" is petrolatum (blistex dct is 54.86% petrolatum), a petroleum product that affords a temporary moisturizing effect but draws moisture from your lips to do so, leaving them dryer than before...necessitating another application. hence, the addiction. sorry for using the comments section here as a soapbox...but on the other hand, blistex works great on pimples, as it dries them out really effectively!